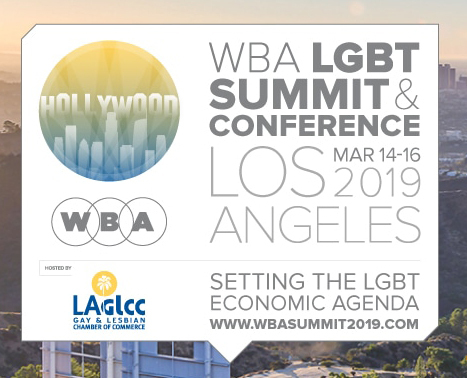 On March 14 & 15, 2019 the Los Angeles LGBT Chamber of Commerce will host the Western Business Alliance (WBA) LGBT Economic Summit & Conference. This year’s conference will focus attention on issues facing our business community and the LGBT community at large, including creating influence, working with the LGBT community, LGBT homelessness and housing, social and corporate responsibility, marketing to millennials, transgender entrepreneurship and freelance opportunities, and access to capital for LGBT businesses. At the center of the WBA LGBT Economic Summit & Conference will be our Lunch Confab, “Understanding and Improving the Effectiveness of Supplier Diversity”, during which we will bring members of other diverse communities together with the LGBT community to examine ways in which we can improve the effectiveness of supplier diversity for all of our communities. Other activities include the opening reception, opening plenary, break-out sessions, luncheon plenary and closing party. The WBA was founded in 1994 as an opportunity for LGBT chambers throughout the Western United States to advocate on behalf of the LGBT economic equality movement, share ‘best practices’ and serve as the collective voice of the LGBT business community in the West. The Rainbow Chamber is not registering people; please register directly with the Loa Angeles LGBT Chamber.